Our campsite lies nestled at the foot of the Nadiža Valley, in the village of Podbela in the wider Breginj area. The campsite warmly welcomes all with a love of unspoiled nature and offers the chance to bathe in pristine mountain waters with beautiful clay, shingle and rock forms among which to frolic in the water. Kamp Nadiža is ideal for families with young children– aside from the bathing fun, the campsite features a playground with climbing frame, slides, swings, large sand basin, volley ball, table tennis and basketball, not to mention two large trampolines, each suitable for up to 4 children at once. The first time we stayed, we were enjoying ourselves so much that we decided to stay two weeks instead of one. The campsite is well-ordered, with plenty of space, also for a car if you have one. Really special was being able to make a fire beside the tent in the evening. Kamp Nadiža, situated near Kobarid in northwest Slovenia, came in second in an online vote by campers on camping website Avtokamp.si, who judged the campsite as excellent, in particular with regard to what it offers for families camping together. 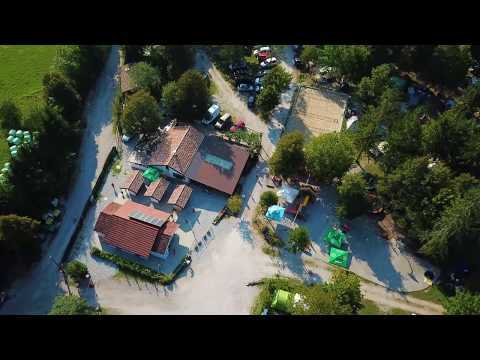 Kamp Nadiža takes first place in the 6th edition of the Naj Kamp Adria, a competition judged by campers, who vote throughout the season for their favourite campsite.